Amalia Post was the first woman to serve as a jury foreman on the world’s first jury to include women, which convened in March of 1870. The women on the grand jury and trial jury were selected less than six months after Wyoming’s first territorial legislature granted women the right to vote. Post was originally the kind of woman who believed that a “woman’s place was in the home.” It took a few of life’s hard knocks to reveal to her the strengths she possessed. A philandering husband left Post alone and destitute in Denver, yet she discovered she had a real knack for negotiating and became quite adept at taking care of herself financially. She raised chickens and loaned out her proceeds to men, collecting interest on the loans. In October 1864, she married one of her business partners, Morton E. Post. This marriage would lead her to a new life in Wyoming Territory, where women were granted the right to vote in 1869. 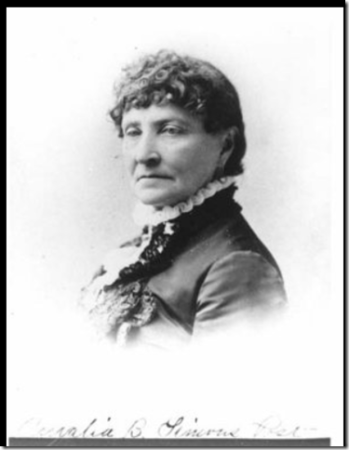 She became not only one of the first women to ever serve on a jury, but also the first woman foreman of a jury. Post would later become a leader in the national women’s suffrage movement. In 1871, the Wyoming Territorial Legislature tried to repeal a woman’s right to vote. Amalia Post is said to have personally lobbied Governor John A. Campbell to veto the bill, which he did. Learn more about Amalia Post.